When I was a little kid I had two favourite bedtime storybook one of them was “One fish, two fish, red fish, blue fish”. I’m sure your just as familiar with the nonsensical story as I am but did you know March 2nd is Dr. Seuss’s Day? A full twenty-four hours where it’s okay for us to make a mess with the Cat in the Hat, dance around with the Fox in Sox, hear a Who with Horton or count the red and blue fish for ourselves. 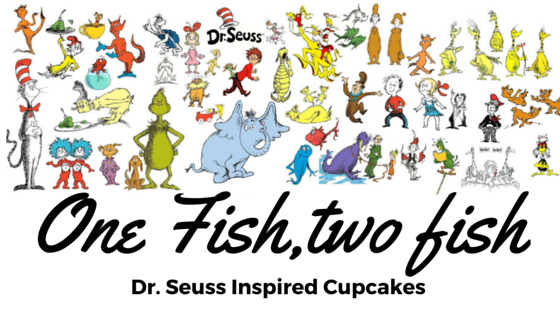 So in honour of such a crazy day we thought it would be fun to make whip up a batch of these Dr.Suess inspired “One Fish two fish cupcakes” to kick off the festivities! The perfect way to celebrate Dr. Suess Day! But don’t let the fun stop there! We have rounded up a bunch of fun ways to help you celebrate Dr. Seuss’s Birthday! Everything from games, activities and yummy eats ’cause what’s a Dr. Suess party without food right? Follow Heather Lawrence’s board Dr. Seuss on Pinterest.How are you planning on celebrating Dr.Seuss day? Will you be whipping up a batch of these adorable Dr. Seuss inspired cupcakes? « Be encouraged – what you are doing matters. I have the best of memories from Dr Suess so this is really cool to do for the kiddies! Super cute. Love the bright frosting. My daughter has her Dr Suess week at school and is having a blast. Today was Wacky Wednesday and I think they had green eggs and ham for snack. These cupcakes are absolutely adorable. I like creating things to match the books I read with my children. That is beyond cute! I can’t believe how simple but impactful it is. I love them. omg these cupcakes look so cute and fun!!! my disgusted would love them since she loves the book! How cute are these?! My daughter and granddaughter are coming to visit so we may make a batch. Pinning for sure! These would be perfect for read across America this week. I should show them to my sons teacher. Such a cute idea. I loved Dr. Suess books when my daughter was little. Such an easy way to teach them to read. What a clever idea – I would love to try these. I would give them as treats with the book to a special child. Those are really cute!.I love Dr. Seuss!….Those cupcakes will be a hit a my house! You are officially the coolest person ever. Can you just open up a bakery shop already so I can come and buy your cakes aha! Oh how cute! I love Swedish fish, but have never found them in any color except red. All these fun Dr. Suess ideas almost make me wish I was still teaching elementary school and celebrating! Super cute cupcakes! Those are adorable! 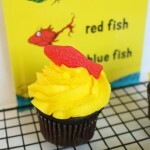 I had no idea there was a Dr. Seuss Day but I would eat these any day! What a great way to incorporate a classic into food form. I know these cupcakes would be a hit in my house. 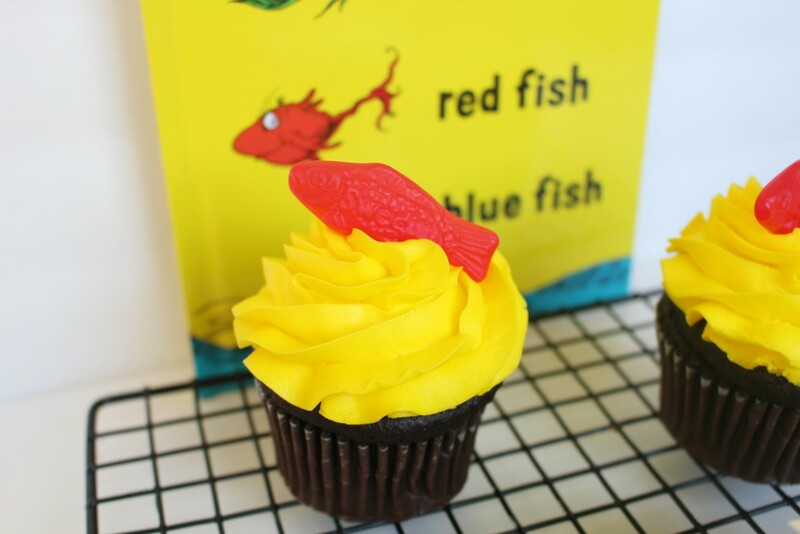 Those are really cute….I love Dr. Seuss books and movies….any child would love eating those cupcakes. Swedish Fish! How genius. I would love to try these. Dr. Seuss is a big deal here because he was from the town next to mine. Even the big mountain inspired the mountain in The Grinch book. So we have a big school party. Yay for Dr. Seuss! Love his books – they are genius! And these cupcakes look so good! Dont think I could recreate them to look that fancy, but they are great! These are cute and easy! My son shares his birthday with Dr. Suess! What a great way to celebrate Doctor Seuss’ birthday on March 2nd. Thanks for sharing this recipe will have to try it out for my own kids. That is one of my favorite Dr Seuss books! Cute cupcakes! How cute. I am a huge r. Suess fan. I still read his books even though son is grown up. Oh my gosssssh! These are too cute!!! These would super cute for Easter treats!